An ivory pendant of rectangular form with a foliate end. The surface is carved in high relief with three figures in a garden setting: an older man is standing on the left with a long stick in his hand, whilst a young boy standing in the middle raises both his arms up, seemingly talking to a third person sitting on the right-hand side, who holds an open book. The remainder of the pendant is carved in detail with a garden scene, with a rocky floor, a stone wall with an oval-shaped window, a layered pavilion and large leafy trees. The back of the pendant is carved in low relief with continuous key-fret pattern. The top is drilled through and attached to a string of coral beads. The ivory has acquired a mellow patina. 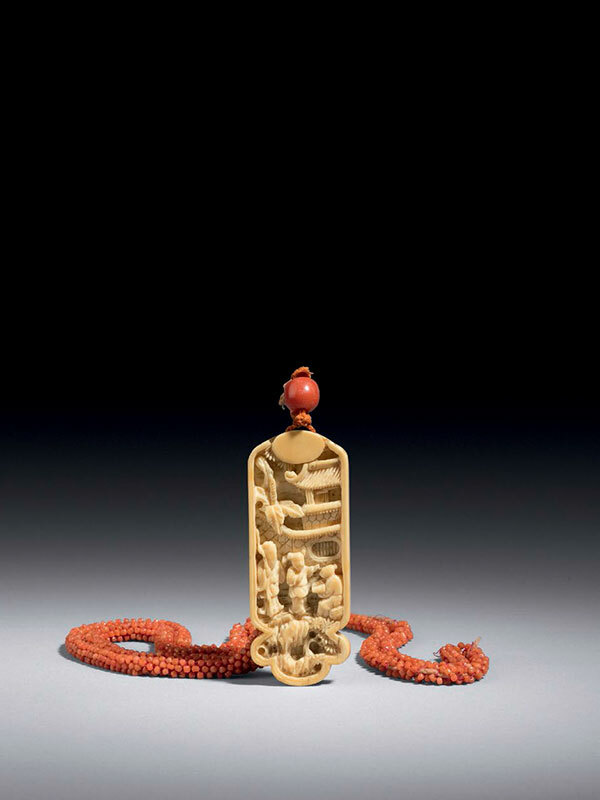 This pendant is a fine example of ivory carving during the late Qing period. 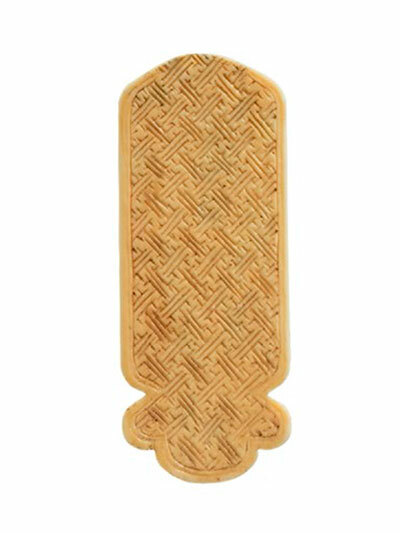 Ivory was already in use from the Shang dynasty (16th century – c. 1046 BC), and has long been considered as one of the precious materials, used for official ornaments, such as ivory belt plaques. During the Ming and Qing dynasties, ivory pieces were widely produced as personal ornaments, and carved with stories of popular literature or with daily scenes. A Ming dynasty ivory pendant, dated to the Jiajing to Chongzhen period (1522 -1644), of similar size and depicting a scene from The Story of the Western Chamber is in the Kwan collection, Hong Kong.1 The present piece, with its high relief carving, is more likely to date later to the Qing dynasty.